My hometown of Richmond, Virginia is fond of putting large statues of white men on horses in the middle of its streets. 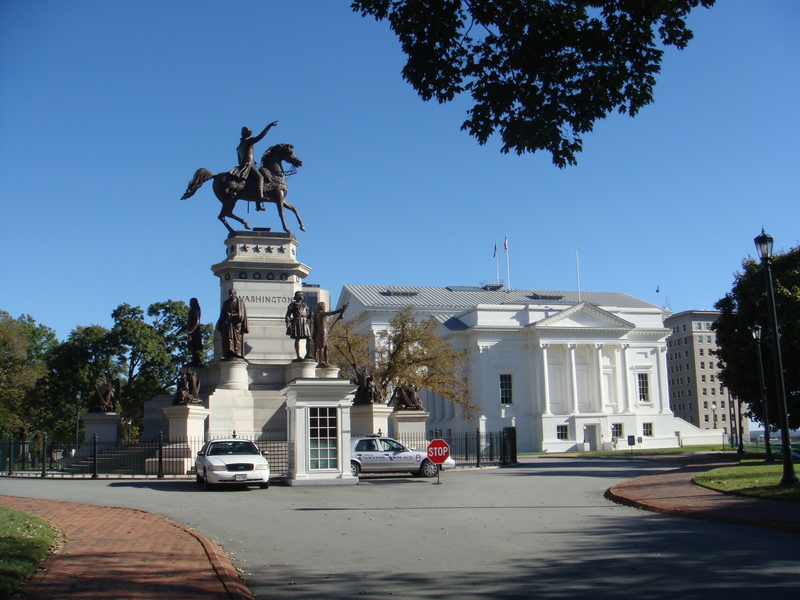 Richmond is also the setting for a political and health care drama of Southern Gothic proportions. Virginia is an ACA non-Medicaid expansion state, but the state’s leaders have been debating Medicaid expansion over the past year. Earlier this month Phillip P. Puckett, a Virginia Democratic state senator, suddenly resigned to take a job on the Virginia tobacco commission. Curious circumstances surrounding his resignation have led to an investigation by the U.S. Department of Justice and the FBI, as reported in this recent Richmond Times Dispatch article. His resignation flipped control of the Virginia State Senate to Republicans intent on blocking Medicaid expansion efforts. Today Virginia Governor Terry McAuliffe announced his plan to bypass the recalcitrant Republican General Assembly and expand Medicaid to 400,000 low-income Virginia residents. (see: Modern Healthcare Va. Governor to Bypass Lawmakers, Expand Medicaid, 6-20-14). Governor McAuliffe also plans to block funding a $300 million facelift of the Capitol complex where many of the lawmakers have their offices. The bright and shiny Virginia State Capitol is shown in this photo I took about a year ago. Medicaid plays vital roles in people’s lives and in our health care system. Medicaid improves access to basic health care services for millions of our children, low-income adults, the elderly (long-term care services), and people with disabilities. Medicaid saves lives. Medicaid funds large portions of our public hospitals, health centers, and nursing homes. Without Medicaid, most of our children’s hospitals would be forced to close. Several of my struggling small business owner nieces and nephews who live in Virginia would benefit from Virginia’s Medicaid expansion. My elderly father who lives in Richmond would benefit from Medicaid expansion for long-term care services not covered by Medicare. My own son who lives in our Medicaid expansion state of Washington is about to get Apple Health, our version of Medicaid because the University of Washington has ended their student health insurance plan–or at least what was masquerading as a health insurance plan (see my previous post, “My Young Invincible, His Lost and Found Toe, and University Health Insurance that ‘Technically Isn’t'” 4-23-14). Virginia and other Southern states have high ratios of physicians to the general population, yet have the worst poverty and shortest life spans of any region in the U.S. Virginia has the second highest number of free clinics in the country. North Carolina has the most and Georgia is close to Virginia’s number. Most of the free clinics are faith-based and pride themselves on not accepting any ‘government handouts.’ This generally includes the clinics not accepting Medicaid or Medicare reimbursements. These Southern states are part of the Black Belt of entrenched poverty and severe health inequities. Are free health clinics part of the solution or part of the problem? The deeply entrenched American notion of charity care as the way to provide safety net services engenders stigma, shame, dependency, and resentment among recipients. Charity care is especially pronounced in the Bible Belt South. People do not want to have to depend on the kindness of strangers. Charity care further fragments an already fragmented, disorganized health care system. Charity care clinics have to compete for donations, grants, staff, and patients. Charity care further fragments and separates us as members of society—sorts us into the haves and the have nots, into worthy and unworthy citizens. Charity care perpetuates poverty. Despite compassionate staff and health care providers, charity care is always leftover care, afterthought care, second-rate care. Charity care gets discouraging, both to give and to receive. I know this first-hand, having been on both the giving and receiving ends of charity health care. Medicaid and Medicare are both basic entitlements; they are not charity care. So Virginians, come down off your high horses and get Medicaid expansion. Posted on June 20, 2014 September 20, 2014 by josephineensignPosted in UncategorizedTagged charity care, Health care, Health insurance, Health policy, Hospital, Medicaid, Medicare, New York Times, Patient Protection and Affordable Care Act, Richmond Times Dispatch, University of Washington, Virginia, Washington. Next Next post: When Is It OK to Write About Patients?